One of the most rewarding things about producing and directing music videos is seeing the impact it makes for a musical artist’s career. Video can be a gateway into enjoying music– don’t get me wrong, songs can be enjoyed purely for their musical integrity, but a good music video can enhance the experience or tell a deeper story that the song alone may not express. 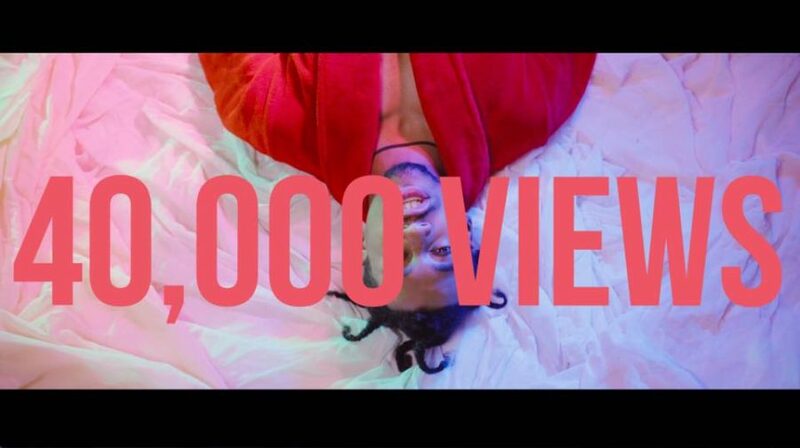 I’m pleased to announce that in its first 2 weeks, Cellus Hamilton’s music video for “Mojo” achieved over 40,000 views! In just the first week it had 20,000 and was featured on Rapzilla.com and HipHopDX among many other sites, blogs, and pages. So proud of how well the video has done since its release! Cellus Hamilton approached me to produce and direct a music video for his new song, “Mojo,” several months ago. He wanted to incorporate symbolism and imagery that told a deeper story than a typical music video, and my creative style was a good fit for the project. His vision was to have two actors to symbolize opposing aspects of the music industry– evil forces such as money, partying, fame– that would fight for his attention and make his artistry impure. These forces would eventually take him to the dark side at the end of the video as the song shifted to a darker, more cryptic tone. His character would evolve from an innocent artist, who entered the world through an almost child-like, “pillow fort” structure, to becoming a demon himself after corruption. I’m a huge fan of extreme close ups. Our camera captured a great amount of detail for a dramatic, cinematic effect. Using extreme close ups in a small space gives the video’s world more range. Bright turquoise war paint was an awesome contrast to the actors’ dark skin tone. Blue, orange, and green halogen lights really sold the look + fog machine, giving him an eerie, spooky appearance. As soon as he described a “pillow fort” type structure, I imagined how we could create something using cardboard and layers of fabric. This was a two part process, with two different structures creating the whole effect. I purchased big, cheap pieces of cardboard from Jerry’s Artarama (my new favorite NYC art shop). And cut them into shapes that I could puzzle piece together into a structure. There were “U” shapes and rectangles. I cut slats into the sides of these shapes so that they could connect, forming a 3D tunnel. This tunnel was used to get the shots of Cellus crawling. I wanted the struggle to look realistic, so it was important that he was really crawling and not just pretending. Art Director, Cassaundra Franklin draped the tunnel in pink fabric, and we lit up the back of the tunnel with amber and orange light for extra depth. A magenta light was positioned left of camera for fill light, and a daylight kino was above and slight right of camera as key light. When he emerged from the structure, I wanted to reveal that the structure was vertical in a wide shot. It would add to the surreal and dreamlike quality of the video, much like in Spike Jonze’s famed Adidas commercial, how gravity shifts as the main character runs. For the second shot, a different structure was made using two large pieces of cardboard. Instead of cutting this time, we folded the edges of the board so that the boards were shaped like pyramids. The folded flaps were taped together, and the centers of the cardboard were folded outward to create a pyramid-like tube that could stand on its own. The opening was large enough for Cellus to sit and stand up in, and was roughly in the shape of a volcano. Cassaundra and I draped the structure in fabric and blended that fabric into the floor in order to fully transform the space. I was really happy with the wide shot. We purchased 3 colors of streamers– white, light pink, and bright pink. Cassaundra diligently cut and taped up the streamers for hours, blending them together perfectly to create the gradient I had in mind. Then, backlighting the volcano with two blue halogens created extra depth– without it, the set would have looked flat and too pink. Subtlety = polish. While it was important to create a surreal world for the story to unfold, I didn’t want to hide the fact that we were shooting in a living room. In fact, I thought that the domestic setting added another layer of metaphor to the story. Cellus concept of a “pillow fort” mixed with the child-like innocence made sense in a space like this, and contrasted with the presence of evil, corrupting demons. Color was important to this world. I purchased a wide variety of color lights and clamp light fixtures, which we positioned and moved manually to get the different kinetic lighting effects. A pretty simple setup, but did the trick in a small, intimate set. Even though this was a story about good vs evil, I wanted to avoid using traditional “red = evil, blue = good” use of color. Instead, I wanted to portray good / evil using shadows and bright light combinations, and using the sweet, soft, pink lights as a weird contrast to the evil characters and the fight that ensued. A lot of the props were purchased from a local party store. Some of the props were sourced from the location (such as those used in the “coven” set), and others came from my personal prop kit. Cassaundra also contributed fabrics and small props from her prop kit, which added a lot of nuance to the set. The overall look of the music video was meant to bring out a sense of “a good time gone wrong” or a sense of what happens when someone parties too hard or gets in over their head. I was pleased with how the production design translated to the final video, and I’m glad that the video and song have resonated with so many people, and hope it continues its forward momentum. Need a music video? Based in NYC? Email me at Lee.Milby@gmail.com and let’s make your vision come to life.